Courtesy of LSu AgCenter Belinda’s Dream rose. Summer heat stresses many plants in our landscapes. Along with other plants, most roses are not especially happy during the extreme heat of mid- to late summer. Come to think of it, neither are most gardeners. Proper care is important as roses enter this most stressful time of the year. Regular watering, mulching, deadheading and controlling insects, diseases and weeds are the major issues we deal with. This is a good month to prune once-blooming roses. These roses, which bloom heavily in spring and early summer and then not at all or very little the rest of the year, will bloom next year on growth they make this summer. Prune appropriately now, if needed. Everblooming roses will continue to bloom through summer. When pruning faded flowers – deadheading – at least cut the stems back to just above the first five-leaflet leaf. You can cut lower on the stem of more vigorous roses to control their size. The next major pruning of everblooming roses will be in late August. The intense heat this time of year can dry out beds surprisingly quickly. Roses planted this year need a regular deep watering whenever we go five to seven days without a good rain – a “good” rain means receiving one-half to 1 inch of rain. Do not count brief rain showers. Established roses are remarkably drought tolerant and generally do not require a great deal of supplemental irrigation. These roses may need to be watered seven to 10 days after the last good rain. During long dry periods, water roses once or twice a week as needed. Avoid wetting the leaves, if possible, by using drip irrigation, soaker hoses or an irrigation system that sprays water below the foliage. If you must wet the leaves, irrigate during the morning or when the foliage will dry rapidly to reduce disease problems. Daytime highs in the mid 90s and nighttime lows in the mid- to upper 70s actually lower the vigor of roses. Despite your best efforts at proper care, you will notice that the flowers your rose bushes produce in mid- to late summer are often smaller with less vivid colors. And the flowers seem to fade almost as soon as they open. Many gardeners interpret the lower vigor and poor-quality flowers to mean that the roses need more fertilizer. Because heat is the issue, however, roses actually need less fertilizer in late June, July and early August. So be moderate in fertilizing if you do any at all now. Mid- to late summer is absolutely the worst time to transplant roses. If you need to move a rose, wait at least until late November if you can. Planting new roses during intense heat is also not a great idea, although container-grown roses can be planted this time of the year if necessary. For roses highly susceptible to black spot, a weekly spray program is important through the summer. Fungicides labeled to control black spot must be used regularly. This is not a disease you can spray for on an as needed basis. Use products labeled to control black spot on roses, and follow the label recommendations carefully. Even with persistent efforts, black spot can show up when we get regular afternoon rains. Still, spraying will generally help. 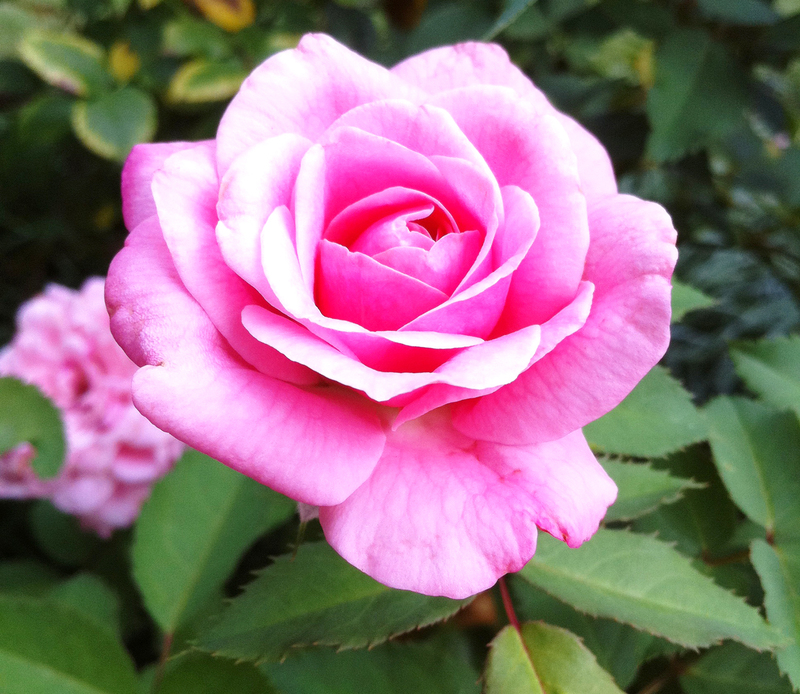 To avoid spraying, choose roses that are more tolerant of or resistant to black spot. Various insects will chew on the foliage or even the flower petals on occasion, but damage is generally minor. For caterpillars, spray the bushes with Bt, spinosad, Sevin, cyfluthrin, bifenthrin or permethrin. The last four will also control beetles and a variety of other insects. Leaf cutter bees chew round pieces about the size of a nickel or dime from the edges of leaves. Damage is generally not bad enough to warrant control. Keep beds well mulched to minimize weeds. A preemergence herbicide, such as Preen or Amaze, labeled for use around ornamentals also can help prevent weeds. For growing weeds, selectively spraying them with the herbicide glyphosate (KillzAll, Eraser, Grass and Weed Killer, Roundup) will kill them. It is critical that none of the spray or drift contacts the leaves or green stems of the roses. Spray on a calm day and, if necessary, place a barrier between a rose bush and what you are spraying. As the outstanding spring and early summer bloom season draws to a close, don’t despair. With good care through the summer, the fall rose-blooming season in October and November can be just as or even more spectacular for the everblooming roses.